Here we keep the a record of the 125 voyages in the Arctic and Antarctic that made Nella Dan a legend among polar ships. The overview was put together with invaluable assistance from private archives and institutions in Denmark and Australia. 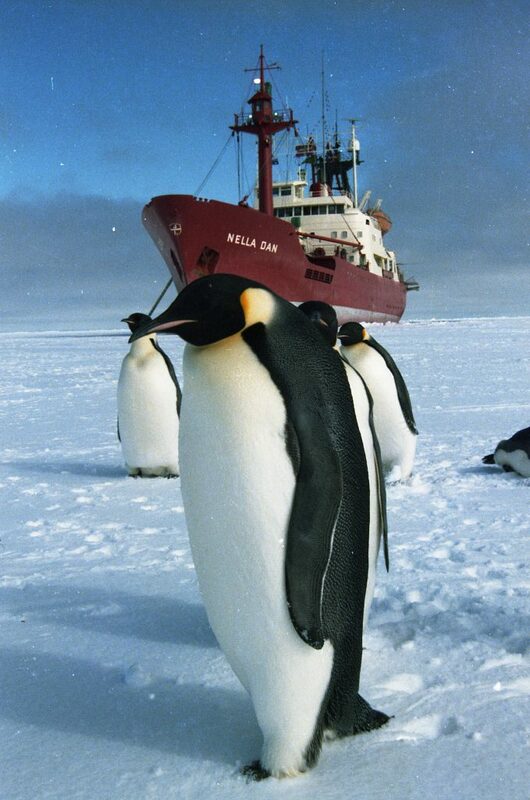 The accounts of the individual voyages include links to content in the film database, to geographic coordinates and to the Australian Antarctic Data Centre (AADC). We continue to search for documentation and records from Nella Dan’s voyages between Denmark and Australia. 9 January -> 24 March Melbourne, Albany, Heard Island, Mawson, Davis, Heard Island, Kerguelen Island, Hobart. 49 voyagers. 4 February -> 18 March Fremantle, Mawson, Davis, Hobart 44 voyagers. 19 March -> 1 April Hobart, Macquarie Island, Melbourne. 22 voyagers. 22 December -> 15 March Melbourne, Mawson, Kemp Land (King Edward VIII Gulf), Mawson, Davis, Amery Ice Shelf, Mawson, Enderby Land, Kemp Land, MacRobertson Land, Mawson, Hobart 43 voyagers. 15 March -> 24 March Hobart, Macquarie Island, Hobart. 17 voyagers. 29 December -> 11 March Melbourne, Wilkes, Mawson, Amery Ice Shelf, Davis, Lewis Island, Hobart. 48 voyagers. 9 March -> 20 March Hobart, Macquarie Island, Melbourne. 49 voyagers. 5 January -> 19 March Melbourne, Wilkes ice edge, Amery Ice Shelf, Mawson - Amery Ice Shelf, Davis, Wilkes (Repstat), Hobart. 47 voyagers. 28 November -> 15 December Melbourne, Macquarie Island, Melbourne. 48 voyagers. 20 December -> 27 January Melbourne, Amery Ice Shelf (Sandefjord Bay), Mawson - Fremantle. 35 voyagers. 29 January -> 27 March Fremantle, Mawson, Davis, Amery Ice Shelf, Mawson -Dumont D'Urville, Macquarie Island, Melbourne. 44 voyagers. 28 November -> 14 December Melbourne, Macquarie Island, Melbourne 55 voyagers. 19 December -> 3 February Melbourne, Davis, Amery Ice Shelf, Mawson, Casey - Fremantle. Captain Bent Thygesen Hansen; Voyage Leader D.F. Styles; 16 voyagers. 6 February -> 16 March Fremantle, Davis, Mawson, Melbourne. 47 voyagers. 12 December -> 29 January Melboume - Mawson - Davis - Mawson - Heard Island - Fremantle. Captain Hans A.J. Nielsen; Voyage Leader D.F. Styles; 47 voyagers. 2 February -> 16 March Fremantle - Davis - Mawson - Heard Island - Mawson - Melbourne. Captain Hans AJ. Nielsen; Voyage Leader E.L. Macklin; 51 voyagers. 16 November -> 2 December Melboume - Macquarie Island - Melbourne. Captain Bent Thygesen Hansen; Voyage Leader G.W. McKinnon; 53 voyagers. 9 December -> 29 January Melbourne - Mawson - Davis - Fremantle. Captain Bent Thygesen Hansen; Voyage Leader D.F. Styles; 54 voyagers. 1 February -> 14 March Fremantle - Davis - Mawson - Casey - Macquarie Island - Melbourne. Captain Bent Thygesen Hansen; Voyage Leader W.F. Young; 47 voyagers. 14 November -> 30 November Melbourne - Macquarie Island - Melbourne. Captain Frank Larsen; Voyage Leader G.W. McKinnon, 54 voyagers. 7 December -> 26 January Melbourne - Mawson - Davis - Fremantle. Captain Frank Larsen; Voyage Leader D.F. Styles; 54 passengers. 1 February -> 10 March Fremantle - Davis - Mawson - Melbourne. Captain Frank Larsen; Voyage Leader E.L. Macklin; 54 voyagers. 24 November -> 9 December Melbourne - Macquarie Island - Melbourne. Captain Helmuth Olaf Klosterman; Voyage Leader W.F. Young; 54 voyagers. 14 December -> 25 January Melboume - Mawson - Davis - Fremantle. Captain Helmuth Olaf Klosterman; Voyage Leader E.L. Macklin; 54 voyagers. 29 January -> 18 March Fremantle - Mawson - Edward VIII Gulf - Davis - Melbourne. Captain Helmuth Olaf Klosterman; Voyage Leader G.D.P. Smith; 43 voyagers. 20 November -> 29 November Port Lyttleton - Macquarie Island - Melbourne. Captain John B. Jensen; Voyage Leader P.H. Sulzberger; 25 voyagers. 7 December -> 22 January Melbourne - Mawson - Enderby Land - Davis - Fremantle. Captain John B. Jensen; Voyage Leader E.L. Macklin; 54 voyagers. 25 January-> 15 March Fremantle - Davis - Mawson - Enderby Land - Casey Macquarie Island - Melbourne. Captain John B. Jensen; Voyage Leader G.D.P. Smith; 45 voyagers. 15 November -> 1 December Melbourne - Macquarie Island - Melbourne. Captain Helmuth Olaf Klosterman; Voyage Leader W.F. Young; 54 voyagers. 8 December -> 18 January Melbourne - Mawson - Davis - Fremantle. Captain Helmuth Olaf Klosterman; Voyage Leader W.F. Young; 54 voyagers. 20 January -> 9 March Fremantle - Davis - Mawson - Enderby Land - Amery Ice Shelf - Melbourne. Captain Helmuth Olaf Klosterman; Voyage Leader A.D. Humphries; 24 voyagers. 18 November -> 4 December Melbourne - Macquarie Island - Melbourne. Captain John B. Jensen; Voyage Leader A.E. Humphries; 54 voyagers. 10 December -> 21 January Melbourne - M.imy ice edge - Mawson - Edward VIII Gulf - Davis - Fremantle. Captain John B. Jensen; Voyage Leader G.W. McKinnon; 54 voyagers. 25 January -> 11 March Fremantle - Davis - Mawson - Gaussberg - Bunger Hills - Melbourne. Captain John B. Jensen; Voyage Leader A. Vrana; 27 voyagers. 10 November -> 27 November Melbourne - Macquarie Island - Melbourne. Captain Helmuth Olaf Klosterman; Voyage Leader A. Vrana; 54 voyagers. 2 December -> 23 January Melbourne - Mirny ice edge - Mawson - Edward VII Gulf - Davis - Fremantle. Captain Helmuth Olaf Klosterman; Voyage Leader G.W. McKinnon; 54 voyagers. 27 January -> 3 March Fremantle - Davis - Mawson - Melbourne. Captain Helmuth Olaf Klosterman; Voyage Leader W.F. Young; 41 voyagers. 15 November -> 29 November Melbourne - Macquarie Island - Melbourne. Captain Helmuth Olaf Klosterman; Voyage Leader A. Argent; 54 voyagers. 5 December -> 25 January Melbourne - Mirny ice edge - Davis - Mawson - Davis - Melbourne. Captain Helmuth Olaf Klosterman; Voyage Leader A. Vrana; 54 voyagers. 31 January -> 10 March Melbourne - Davis - Mawson - Melboume. Captain Helmuth Olaf Klosterman; Voyage Leader T.W. Weatherson; 49 voyagers. 19 October -> 2 November Melbourne - Macquarie Island - Melbourne. Captain Peter Granholm; Voyage Leader K.R. Kerry; 52 voyagers. 9 Novernber -> 14 December Melbourne - Mawson - Melbourne. Captain Peter Granholm; Voyage Leader R.M. Lightfoot; 54 voyagers. 20 December -> 1 February Melbourne - Davis - Mawson - Davis - Melbourne. Captain Peter Granholm; Voyage Leader, number of voyagers not recorded. 7 February -> 20 March Melbourne - Davis - Mawson - Melbourne. Captain Peter Granholm; Voyage Leader I. Holmes; 16 voyagers. 20 October -> 5 November Melbourne - Macquarie Island - Melbourne. Captain Peter Granholm: Voyage Leader I.F. Allison; 53 voyagers. 8 November -> 14 November Melbourne - Bass Strait - Melbourne (marine science trials). Captain Peter Granholm; Voyage Leader K.R. Kerry. 20 November -> 31 December Melbourne - Mawson ice edge - Davis ice edge - Melbourne. Captain Peter Granholm; Voyage Leader T.W. Weatherson; 52 voyagers. 9 January -> 24 March Melbourne - marine science cruise - Davis - Mawson - marine science - Davis - marine science - Casey - Hobart - Melbourne. Captain Peter Granholm; Voyage Leader K.R. Kerry; 54 voyagers. 17 October -> 3 November Hobart - Macquarie Island - ice edge trials - Macquarie Island - Hobart. Captain John Jensen; Voyage Leader K.R. Kerry; 45 voyagers. 8 November -> 18 December Hobart - Mawson ice edge - Davis ice edge - Hobart. Captain John Jensen; Voyage Leader G.J. Manning; 54 voyagers. 31 December -> 15 March Hobart - Davis - Mawson - marine science - Mawson - Hobart. Captain John Jensen; Voyage Leader P.G. Guilty; 54 voyagers. 22 October -> 2 November Hobart - Macquarie Island - Hobart. Captain Arne J. Sorensen; Voyage Leader D.J. Lugg; 52 voyagers. 8 November -> 30 December Hobart - marine science - Mawson ice edge - marine science Davis ice edge - Hobart. Captain Arne J. Sorensen; Voyage Leader K.R. Kerry; 47 voyagers. 7 January -> 1 February Hobart - Casey - Macquarie Island - Hobart. Captain Arne J. Sorensen Voyage Leader G.J. Manning; 40 voyagers. 7 February -> 23 March Hobart - Casey - Davis - Mawson - marine science - Mawson - Heard Island - Hobart. Captain Arne J. Sorensen; Voyage Leader A. Vrana; 24 voyagers. 15 October -> 17 November Hobart - Macquarie Island - Casey ice edge - Macquarie Island - Hobart. Captain Arne J. Sorensen; Voyage Leader R.B. Ledingham; 41 voyagers. 20 November -> 29 December Hobart - Mawson ice edge - Scullin Monolith - Davis ice edge Hobart. Captain Arne J. Sorensen; Voyage Leader M.S. Betts; 48 voyagers. 3 January -> 16 February Hobart - Davis - marine science - Mawson - Hobart. Captain Arne J. Sorensen; Voyage Leader K.R. Kerry; 54 voyagers. 18 February -> 19 March Hobart - Davis - Mawson - Hobart. Captain Arne J. Sorensen; Voyage Leader D.J. Lugg; 23 voyagers. 18 October -> 30 October Hobart - Macquarie Island - Hobart. Captain Arne J. Sorensen; Voyage Leader M.S. Betts; 40 voyagers. 2 November -> 17 December Hobart - Casey ice edge - Mawson ice edge - Davis ice edge Hobart. Captain Arne J. Sorensen; Voyage Leader M.S. Betts; 54 voyagers. 22 December -> 4 February Hobart - marine science - Davis - marine science - Hobart. Captain Arne J. Sorensen; Voyage Leader H.J. Marchant; 31 voyagers. 8 February -> 17 March Hobart - Davis - Mawson - Shackleton Ice Shelf - Hobart. Captain Arne J. Sorensen; Voyage Leader I.T. Marchant; 50 voyagers. 16 September -> 29 December Hobart - Heard Island - marine science (including 48-day besetment) - Heard Island - Hobart. Captain Arne J. Sorensen; Voyage Leader K.R. Kerry; 51 voyagers. 4 January -> 22 February Hobart - Shackleton Ice Shelf - Davis - Prydz Bay - Davis - Prydz Bay - Mawson - Davis - Mawson - Davis - Shackleton Ice Shelf - Casey - Hobart. Captain Arne J. Sorensen; Voyage Leader T. Maggs; 54 voyagers. 24 February -> 26 March Hobart - Shackleton Ice Shelf - Davis - Mawson - Albany. Captain Arne J. Sorensen; Voyage Leader I.T. Marchant; 43 voyagers. 24 October -> 1 December Fremantle - Mawson ice edge - Heard Island - Hobart. Captain Arne J. Sorensen; Voyage Leader I.T. Marchant; 53 voyagers. 3 December -> 14 December Hobart - Macquarie Island - Hobart. Captain Arne J. Sorensen; Voyage Leader D.J. Lugg; 54 voyagers. 18 December -> 2 February Hobart - Commonwealth Bay - Dumont D'Urville - Commonwealth Bay - Casey - Edgeworth Davis - Law - Davis - Macquarie Island - Hobart. Captain Arne J. Sorensen; Voyage Leader J.E. Bleasel; 34 voyagers. 5 February -> 3 April Hobart - marine science - Davis - marine science - Hobart. Captain Arne Dethlefs; Voyage Leader R. Williams; 22 voyagers. 8 September -> 30 September Fremantle - Heard Island - Fremantle. Captain Arne J. Sorensen; Voyage Leader L. Francis; 54 voyagers. 2 October -> 23 November Hobart - Macquarie Island - Heard Island - Davis - I-narine science - Hobart. Captain Arne J. Sorensen; Voyage Leader A. Vrana, 46 voyagers. Marine science trial cruise, 23 November - 25 November. 25 November -> 3 December Hobart - Macquarie Island. Captain Arne J. Sorensen; Voyage Leader D.J. Lyons; 50 voyagers. Aground at Buckles Bay 3 December; scuttled off Macquarie Island 24 December.